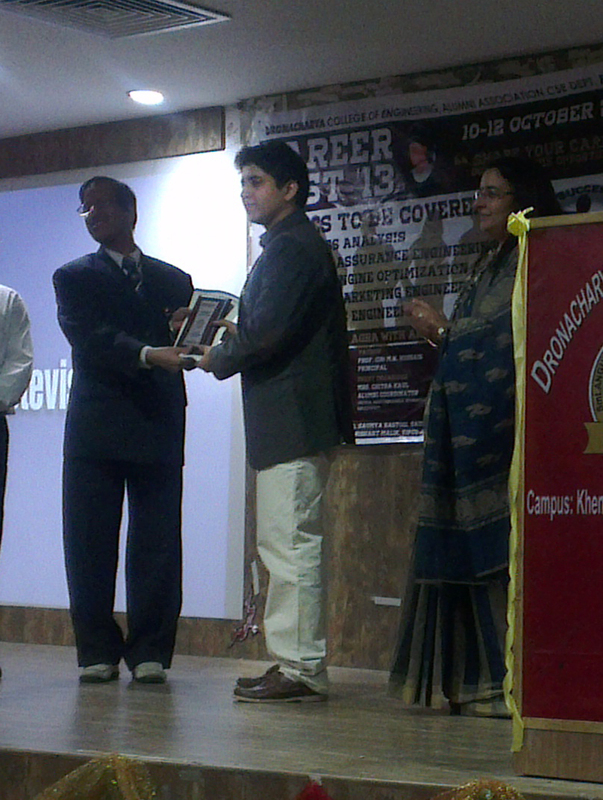 Ayaan Chawla’s Seminar At Dronacharya College Of Engineering to deliver a session for their students that “How to compete with the outside world” at CareerFest 2013. Occupation Founder & CEO of Asian Fox Developments, Global Web Mount, Mind-In Advertising and Group For Buddies. Ayaan Chawla was born in India on 30th April 1997 to Ms. Kunjam Chawla (Mother), Former Chairman of Asian Fox Developments, basically a Fashion Designer. He has an elder sister Ms. Jyolsha Chawla. Ayaan received his first computer, a PC, at the age of 8 in 2005 and after some years of exploring he used that PC to create movies with video editing tools and one fine day he thought about the software & applications he was using for creating those videos. Ayaan began studying about applications / computer programming languages through himself with the help of dozen books & internet with that he began coding websites, softwares & apps at the age of 13 in 2010 and after a year later he founded a social utility for people to connect with each other globally, on 1st January 2011 called “Group For Buddies”, and on 7th March 2011 he founded an IT company for IT solutions called “Asian Fox Developments”. After a year later on 15th May, 2013 he founded a company for web solutions called “Global Web Mount”, and on 27th July 2013 he founded a another company for Media & Marketing services called “Mind-In Advertising”. He was invited as speaker, panelist, & attendee (VIP) number of times in conferences, seminars, events & webinars of organizations & universities globally such as Directi, Microsoft, Autodesk, Telerik, etc. – Invited in various conferences of entrepreneurs, business people & public figures globally. – Invited by corporate companies for management trainings. – Invited by Schools, Universities, Institutions, Haryana Education Board for lectures. – Invited for industry meetings with Government Bodies & Bank Managements, etc. Received appreciation letter at Prime Minister’s Office, New Delhi, India. Represented India at Chevrolet Hack Lab in Detroit, Michigan – USA. Featured in various publications such as The Huffington Post, YourStory, Dainik Jagran, Youth Incorporated Magazine, Entrepreneur India, The Hans India, School Live, etc. Titled as “India’s Youngest CEO With A Heart Of Gold”. On September 21st, 2014, received award for “Young Entrepreneur of the Year – 2014? by Industry Eminence Awards 2014. Awarded as “Young Entrepreneur of the Year – 2014” by Franchise India – Entrepreneur India 2014 on July 18th, 2014. Invited as Guest Panelist in various conferences & seminars. Seen in Tweets, Retweets and Social Mentions by known Business Tycoons, Foreign Former Country Presidents, Foreign Ministers, Largest Technology Entities, Famous Bollywood Actors, etc. In September 2014, was repositioned in the list of Top Entrepreneurs from India at 6th position based on popularity this list includes Mukesh Ambani, Ratan Tata, Vinod Khosla & etc. In the list of Top Entrepreneurs Globally was at 288th position based on popularity this list includes Bill Gates, Steve Jobs, Mark Zuckerberg & etc. An author Dr. Anupam Kurlwal willing to write book on entrepreneurship journey. Received various mementos by engineering and business institutions across India. Invited by Haryana Education Board for lectures in various institutions about importance of Education, Jobs, Business, etc. Announced as winner of Telerik in 2012 after a seminar of Telerik, U.S. Invited as speaker in Enterprise Connect event in Orlando, Florida, U.S. Invited for the 10th Anniversary of WorldHostingDays in Rust, Germany – April 2014 – by Thomas Strohe (Founder of WorldHostingDays). “Asian Fox Developments” has done contracts as IT & ONLINE MEDIA PARTNER with Bollywood Movies. In 2012, received award for creating ESWDG in India by Triple A Company. ABOUT: Established in 2011, ‘Asian Fox Developments’ is an awarded & leading global corporate company, which serves over 1,00,000+ enterprise, SMB, SOHO, retail and individual customers & users across multiple geographies. ‘Asian Fox Developments’ (http://www.asianfoxdevelopments.com) is a group of businesses, that develop innovative mass-market IT, Web & Marketing – Products and Services. Company has done projects for Corporates, Industries, Individuals & Start-ups worldwide including Movies, Government, Army, Politicians, etc. All our businesses have been profitable from inception. All assets of the group are organically funded without any external debt or borrowing. ABOUT: Global Web Mount is one of the most preferred Domain & Hosting company globally. Company offers Domain Name Registration, Web Hosting (Shared Hosting, VPS, Dedicated Servers, Managed Servers), SSL Certificates, Website Security Tools, Website Builder Tools and many more. ABOUT: Mind-In Advertising is ranked one of the #1 best Media & Marketing companies globally with support of wide range of services – Digital Marketing, Advertisement On Our Network, Contextual Ad Network, Online Media Marketing, Media Marketing, Online Advertising Services, SEO, SMO, SEM, SMM, Website Marketing / Promotion, Movie-Film-Video Marketing, Product-Business-Service Marketing, BPO – Telecom – Call Center, Bulk SMS Service, TV & Radio Advertising… etc. ABOUT: Group For Buddies is a social utility that connects people with friends and others who work, study and live around them. People use Group For Buddies to keep up with friends, upload unlimited number of photos, post links and videos, and know more about the people they meet.